Blue cheese is made from milk by separating whey and curds. Some whey is kept with the curds, which are then cubed and fermented. The fermenting process for blue cheese and Roquefort is a different process than most other types of cheese, because it is usually not pasteurized or homogenized. Instead, a mold is introduced into the milk or curds; then the product is salted and stored. It ferments for three months or longer. 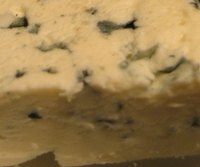 Blue cheese is a general category of semisoft cheeses with blue or blue-green veins running through their creamy white foundation. Roquefort cheese is a type of blue cheese, native to Roquefort-sur-Soulzon, France. There is a special type of mold that grows in the village's caves called Penicillium roqueforti. Under declaration from the French government, only certain permit-holders are allowed to use these caves, and only cheese made from Penicillium roqueforti can be labeled Roquefort cheese. Roqufort cheese is native to Roquefort-sur-Soulzon, France. Blue cheeses are made from the milk of cows, sheep, goats or a combination of them. Each type of milk creates a different taste and texture, which is a distinguishing factor for each type of blue cheese. For example, Danish blue is made from cow's milk, while Roquefort is made of sheep's milk. Within the blue cheese classification, some types are more crumbly or tangy than others, depending on the amount of whey reserved, mold used and geographical location of production. Blue cheese has a creamy white base with bluish veins running through it. According to a French government mandate, at least 75 percent of the grazing material for sheep producing milk used in Roquefort cheese must be native to the region. Sheep not fed this special diet are not eligible to produce milk for certified Roquefort cheese. Only Laucane sheep in a 65-mile radius of the village caves make up the Roquefort milk donor group. An acquired taste, blue cheese is most famous for its presence in salad dressing. True Roquefort dressing is less common, but the terms are often used interchangeably, without distinction. A wedge of blue cheese or Roquefort is acceptable on a cheese plate or served with fruit as an appetizer or as accompaniments on a salad. An assortment of cheeses usually has at least one blue cheese included, and because Roquefort has such a strong, bold flavor, it is often chosen to represent this group. When cooking recipes for any dish refer to blue cheese, any type from the category is acceptable unless specified by name. The very common Danish blue is often referred to simply as "blue cheese" and is less expensive than Roquefort. Danish blue is more dry and crumbly, whereas Roquefort is more moist and holds together better. Though still tangy, Danish blue is milder in flavor. Both varieties pair well with red or dessert wine and neither has a rind.